Every album these days seems to have a backstory and this (via Rolling Stone) turns out to the first from a major rap group to be entirely funded by Kickstarter. De La Soul met their goal a few times over as fans came from everywhere to contribute, a clear call back to when they were one of the best hip hop acts on the planet. Not having released an album in 12 years, then doing it themselves, allowed the group to indulge themselves fully, and it is exactly times like this that an outsider editor or record label may actually come in handy as the album goes on and on with various levels of good ideas. Musically the album was recorded with the live band The Los Angeles' Rhythm Roots All-Stars with lots of post production work going on mostly by the band and Supa Dave West. Lush bass rolls and crisp hi hats are welcomed, far from their early sample heavy outputs, but also far from today's lack of kick drum mainstream hip-hop. The smooth sounds are soothing (perhaps a bit too snoozing at times) as the organic mixes gel with the produced remixes. The band brings in tons of guest stars letting both new artists pay tribute (2 Chainz on "Whoodeeni") and old friends contribute (Pete Rock with Estelle on "Memory Of..."). They also try to adjust things on a few tracks like the large rock inspired epic "Lord Intended" with Justin Hawkins from The Darkness adding an Elton John like vibe and some mid level electric guitar. More successful is the art filled "Snoopies" that has David Byrne some strings, bopping bass pops, and dramatic swelling (a full length combo between these two factions could be incredibly interesting). Usher arrives with minimalist overtones on "Greyhounds" and ends up busing in dull results while the Damon Albarn mash up "Here In After" is a awkward paced, skittering ode to De La Soul still being here, even though they just got back. "CBGBS" finds the Plug's in fine form but it is only an energizing place holder, there are quite a few of those on the album. 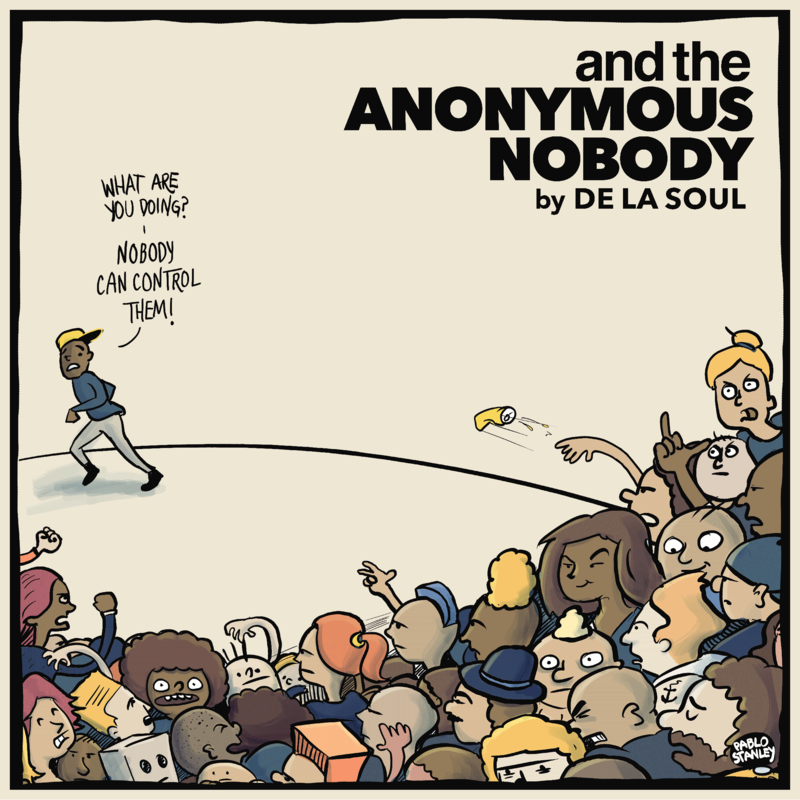 And The Anonymous Nobody... it is supposed to be listened to as an album, for example the soundscapes on "Drawn" lead into the club rhymes of "Whoodeeni". "Nosed Up" feels the most like a return to form with odd P-funk like lyrics, a great twist on beats and simple fun, and it is also a track that keeps the guests away. In the end And The Anonymous Nobody... suffers from overkill, songs run long, there is filler and things seem to amble, not always a bad thing but not all good either; there is also no standout track. Surely those who contributed will be excited to receive so much for their money, but a bit of editing would have resulted in a better overall album. Hopefully the hiatus has ended for Posdenus, Dave and Maseo as their return to hip hop can only lead to interesting results.